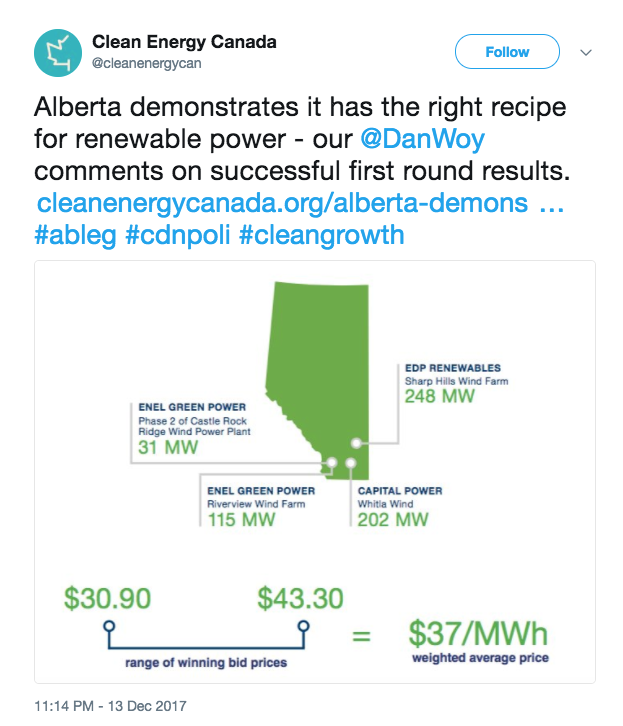 CANADA: Alberta's first renewable energy auction has set a new low for wind energy costs in Canada, with the four winning projects bidding a record-shattering average price of C$0.037/kWh ($0.029/kWh). Bid prices for the four projects ranged from C$30.90/MWh-C$43.30/MWh, prompting the province to up its purchase to nearly 600MW of wind instead of the 400MW originally targeted in the auction. Even with the added power, the government said, the entire auction still came in under the original budget. "I think you could say the results of this round exceeded even our most optimistic expectations," said the province's energy minister Margaret McCuaig-Boyd during a news conference announcing the auction results. Alberta's new wind projects will be "cheaper than a new gas plant, even with current all-time-low gas prices," noted Binnu Jeyakumar, program director for electricity at the Pembina Institute, a sustainable energy think-tank. EDP Renewables Canada's 248.4MW Sharp Hills project and Capital Power's 201.6MW Whitla project, both located in southeastern Alberta and both slated to use Vestas turbines, are the two largest projects selected. 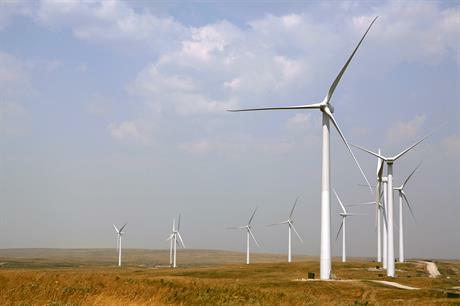 Enel Green Power Canada will build the 115MW Riverview and 30.6MW Castle Rock Ridge Phase 2 projects in southwestern Alberta, which are expected to use Siemens Gamesa and Enercon turbines respectively. The companies will sign 20-year agreements with the Alberta Electric System Operator (AESO) based on a contract for difference (CfD) structure that will see developers receive a top-up payment when wholesale electricity prices fall below their bid price, and pay the government back the difference when power prices are higher. With wholesale power prices averaging C$22/MWh so far this year, Make analyst Anthony Logan says the provincial government should be "breathing a sigh of relief" over the low prices. "A higher winning bid with sustained low pool prices could have yielded a price spread that was unpleasantly large, creating an unwelcome political football ahead of the 2019 elections," Logan said. The price will challenge equipment manufacturers, however, putting "a lot of pressure on logistics costs and the wider supply chain," Logan says. "There aren't many suppliers who can make a profit at these prices." The auction is the first step in Alberta's plan to add up to 5GW of renewable energy to its grid by 2030. The results provide a much-need shot in the arm for Canada's wind sector, which is being buffeted by low demand growth and electricity surpluses in Ontario and Quebec, which have been the engines of the industry's growth over the past decade.